Unique Art Manufacturing Company was an American toy company, founded in 1916, based in Newark, New Jersey that made inexpensive toys, including wind-up mechanical toys, out of lithographed tin. One of its early products was a wind-up toy featuring two tin boxers. The company scored a hit in the 1940's when it acquired the rights to a popular comic strip and released the Li'l Abner Dogpatch Band for Christmas 1945. The windup toy featured Abner dancing, Pappy on drums, Mammy with a drum stick, and Daisy Mae playing piano. Unique followed with a Howdy Doody band several years later. The company made a tinplate wind-up toy called Unique Artie, which was a clown riding in a jeep-like vehicle similar to Marx's Jumpin Jeep. Unique's president, Sammy Bergman, was a good friend of toy magnate Louis Marx, and the two men's companies at times cooperated, with Marx providing tooling to Unique and sometimes acting as a distributor for Unique's products. In 1949, Unique began producing lithographed tin 'O' gauge toy trains, using tooling of its own design along with some recycled tooling from the defunct Dorfan Company. Unique sold its trains in inexpensive ready to run boxed sets. The ready to run sets were offered in electric three rail and clockwork two rail versions. The electric powered sets included track made by Unique Art, a transformer, and a separate rheostat in a control tower. Sets were available as either freight sets or passenger sets. All sets came with an 0-4-0 steam engine and 4 wheel tender. #742 was the number found on the clockwork locomotive, and #1950 was used for the electric powered engine. The freight cars offered were Hoppers, boxcars, cabooses and a very hard to find crane that was made using the same dies and tooling as the Dorfan #610 Derrick. Passenger trains had 2 pullman type cars labeled City of Joplin or Garden City. These Unique Lines passenger cars were also made using the acquired Dorfan dies and tooling, but were more toy-like in appearance than the Dorfan passenger cars. All cars shared the same four wheel bases employing a truss and queenpost arrangement between the wheelsets. This makes them easily identifiable as Unique Art product. At 7½ inches long, these cars were slightly bigger in size than Marx's tinplate litho freight cars. The passenger cars were slightly longer than the freight cars. 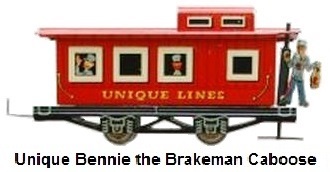 The Bennie the Brakeman caboose featured a novelty that no other train manufacturer ever produced - a brakeman that actually swung from the rear end of a caboose as it made its way around the track. 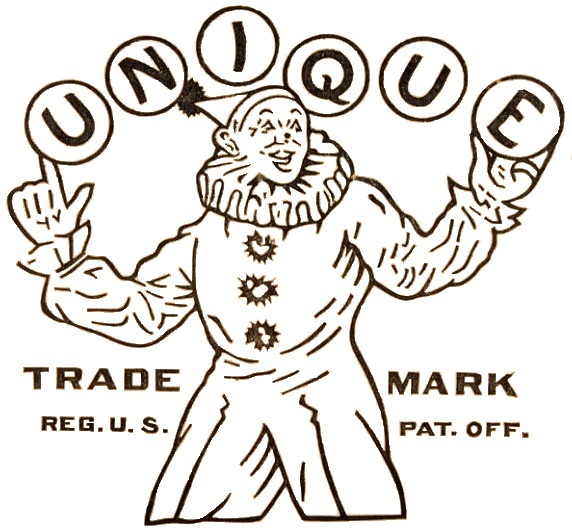 The company logo was a clown, named Unique Artie, juggling 6 balls that spelled out Unique. All train cars were labeled Unique Lines with a small copy of this logo displayed somewhere on the car. Unique also produced a circus set that was both distributed on a car-by-car basis by the Jewel Companies, that was labeled for Jewel T, and a version of its own, labeled Unique Lines. 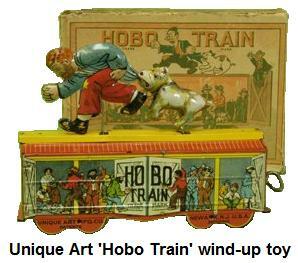 This set consisted of the standard #1950 locomotive with tender, two lithographed circus cars, and a caboose. The cicus cars used the same box car frame but came with two different lithograhed RR animal cage transport scenes. The cars that came in the Jewel T set had roofs, but the two cars in the regular set did not. They were deep-sided gondolas with a lion in one and an elephant in the other, and were lettered Unique Circus. In 1950 Unique Art created a highly attractive set of F-7 style diesal locomotives using a process long abandonded by most toy train manufacturers. The lithographed #2000 Rock Island RR locomotives, at 14" were longer than any other 'O' gauge diesel ever made by the likes of Lionel, Marx, or American Flyer. They were equipped with a working headlight, a single power truck and a reversing mechanism. The power truck included two rubber tires to increase traction. The toylike appearance of these locomotives limited sales however, as young hobbyists were opting for the more scalelike and realistic looking models of F3's being offered by Lionel. These Unique Lines units also lacked the hauling power to pull more than a few cars. Bergman offered them with diesal coupler adapters that would allow connecting Lionel cars. Marx saw the development and sale of toy trains by Unique as a betrayal and responded by creating a new line similar in size to Unique's, but with lithography that looked more realistic. As a result, Unique found itself unable to compete, and withdrew its trains from the marketplace by 1951. While only made for a brief period of a few years, the Unique Art Mfg. train items were colorful and memorable, with novelty themes and unusal styling. Unique Line trains are often confused as being either Marx or Hafner since they are compatible with those other tinplate 'O' and 'O-27' gauge lithographed train systems, but they do not maintain or hold the same value among collectors. The tinplate lithographed passenger cars made from the Dorfan dies and tooling are the hardest items to find, and are considered to be the most valuable of the Unique Lines products, from a collectors perspective. Although Unique was not able to capture much of a piece of the toy train craze of the early 1950's, a tin typewriter toy introduced during the same time frame did take market share away from Marx, who had a similar toy. Marx responded by moving production of its typewriter toy to Japan in order to undercut Unique's price. Unique Art's eventual fate is unclear but the company appears to have disappeared by 1952.